EASY PIGS IN A BLANKET – Just 3 ingredients and only 5 minutes of preparation! 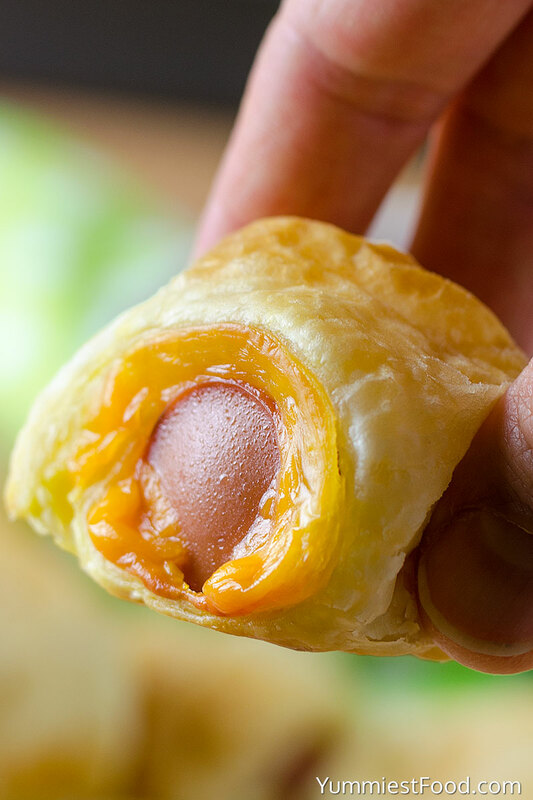 Easy Pigs in a Blanket with hot dogs and cheese are a perfect appetizer for Super Bowl! What is your overall go-to party appetizer? For me, it’s this Easy Pigs in a Blanket. Why? 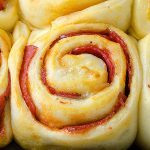 Because everyone smiles when they see cheesy Pigs in a Blanket at a party, they are a classic, easy to make a recipe that kids and adults both love. 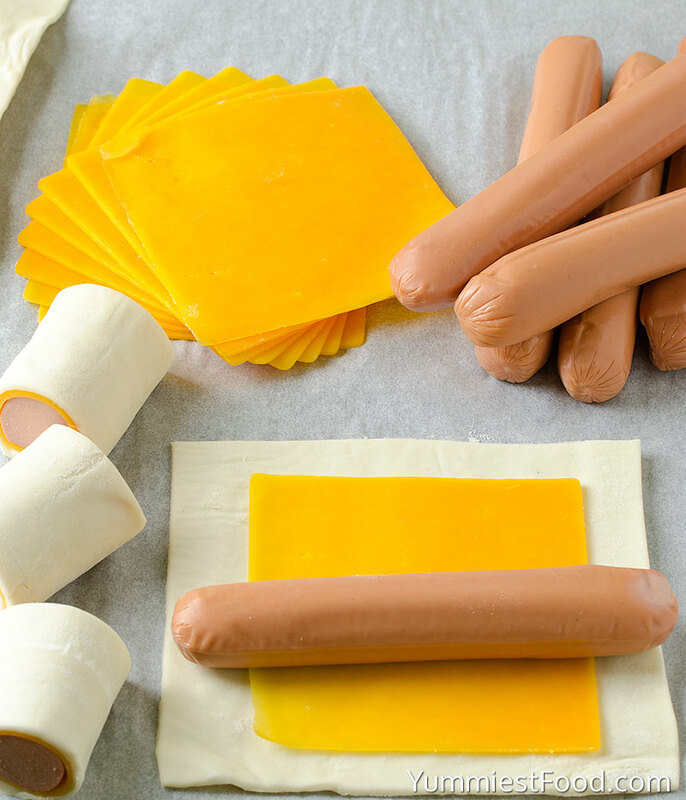 This easy recipe requires only three ingredients, simply wrap hot dogs and cheddar cheese in puff pastry and bake. Easy Pigs in a Blanket are a fun twist on a childhood favorite. The puff pastry gives them that little something extra. Every time I made it turns great and every time we taste this recipe it is delicious. I am very satisfied with this recipe because everyone likes it and also I can prepare every time I want. We eat these for football parties, birthday parties, neighborhood parties… Bake them for a cocktail party or just a casual night. Really this recipe is a way to love at first bite, they’re that good. They can be prepped and ready for the oven for 20 minutes. What could go wrong with puff pastry, cheddar cheese and hot dogs? No party would be complete without the delicious of easy bites. I suggest you serve these Easy Pigs in a Blanket with a bowl of ketchup. These are really yummy dippers! These little bites would be a great Game day snack. My friends like this little snack very much so I made them very often when friends come over. I think that you can’t get the wrong choice with these Easy Pigs in a Blanket. You will see when you make them they will disappear for a very short time of your plate and these recipes are a very good choice because guests can eat them by hand. They are easy to make ahead of time and you can keep a few trays in the fridge. 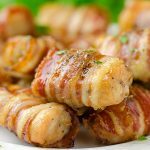 If you need more ideas for Game day food, I suggest you check my recipes: Easy and Sweet Chicken Bacon Bites, Easy Homemade Pizza Braid, Pepperoni Pizza Rolls and Meatballs with Homemade BBQ Sauce. Enjoy! EASY PIGS IN A BLANKET - Just 3 ingredients and only 5 minutes of preparation! 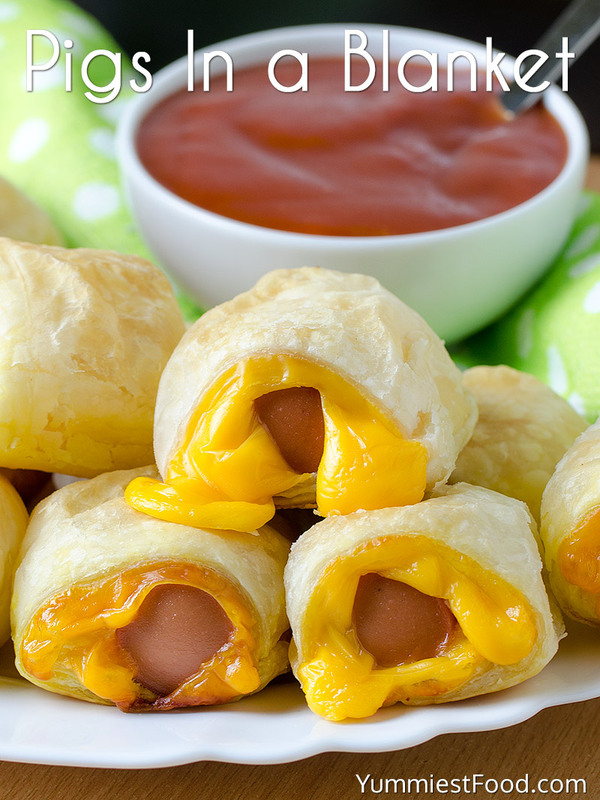 Easy Pigs in a Blanket with hot dogs and cheese are a perfect appetizer for Super Bowl!